Joe and I will be teaching our Acquisition Finance Course in Amsterdam in less than two months. One of the things we start with in the course is identifying ways in which Acquisition Finance creates value. I can't cover all of these in a short blog post but I'll try to outline some of the concepts and ideas. Acquisition finance involves some change in the capitalization of a company. That is, some change in the way it is financed. It can occur as a result of a sale of the company to new owners or a recapitalization of the company under the existing owners. In the case of an LBO or MBO, management is often part of the buyout team. It is also common for the new financial structure to involve high amounts of leverage, hence the term LBO or HLT (highly levered transactions). As we have also noted, highly leveraged transactions increase risk (see Six Disadvantages of Highly Levered Firms). And see Joe's recent column where he notes that just because you can do something, doesn't mean you should! (See Leveraged Acquisition Loans: Fasten Your Seat Belts.) The art of the deal is finding the right balance, measuring the rewards of acquisition finance against the risks. 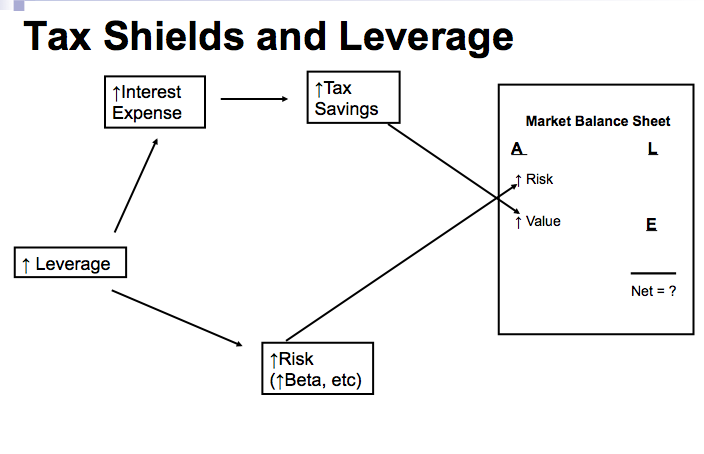 The following slide conveys the idea, considering just one of the advantages of high leverage, tax shields. Increased leverage increases a firm's interest expense. Since interest is deductible for tax purposes, this results in an annual tax savings. The capitalized value of this tax savings increases a firm's market value, a positive. But increased leverage also increases risk - a negative in terms of firm value. And so the net impact must be carefully considered. 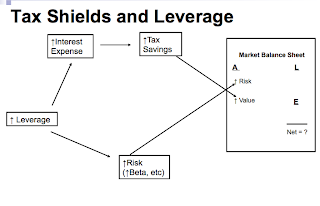 In future blogs, and certainly in our course, we'll discuss more of the specifics: with tax shields this includes how to evaluate the level of risk, how to capitalize the value of the tax shields, how increased leverage directly impacts a firm's beta coefficient (and hence the required rate of return) and why discount rates are likely to change over time in the typical HLT. A good web site with exciting content, this is what I need. Thanks for keeping this web-site, I will be visiting it. Do you do newsletters?